Wilmington, NC has become a sought after destination for sports events planners thanks to good weather year-round and its location situated along the Cape Fear River, Intracoastal Waterway and the Atlantic Ocean. 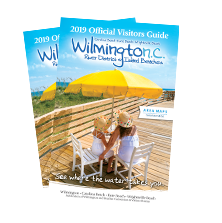 The convenient location to get here by car or plane and the opportunity to increase participant and spectator attendance are just some of the reasons why many sporting event planners have selected Wilmington and our island beaches and here are a few more. View our Sports Planning Guide for more information. As North Carolin&apos;a most accessible coastal destination, it&apos;s convenient to get here no matter how you&apos;re traveling. Carolina Cup, which takes place in Wrightsville Beach, is ranked as the #2 race in the world in the category of professional men and #3 in the category of professional women, according to Australia’s SUPracer.com. IRONMAN 70.3 North Carolina won in two worldwide categories in the Athletes&apos; Choice Awards. The triathlon spans Wrightsville Beach and Wilmington and ranks second for best overall run and tied for fifth in best overall swim in the world. The annual Wrightsville Beach Marathon Madness is a Boston Marathon qualifying event and an USATF certified qualifier. The U.S. Open Fat Bike Beach Championship brings fat bike cyclists from all over the country each year to compete on the sandy shores of Wrightsville Beach. Wilmington is one of the top destinations in the country for a “Weekend Runcation” according to Runner’s World, which makes it ideal for running events. TrailRunner.com featured Carolina Beach as a featured Trail Town. Triathlete Magazine includes Wilmington among its “Best Places to Live for Triathletes,” citing mild winters, triathlon clubs, ocean, Intracoastal Waterway, historic riverfront and the Gary Shell Cross-City Trail. The League of American Bicyclists designated Wilmington as a Bicycle Friendly Community. This award is presented to communities that have shown a significant commitment to bicycling. Men’s Journal previously named Wrightsville Beach North Carolina’s most naturally gifted water sport hub. Attendees can arrive early or stay late to enjoy our three beach towns or the historic charm of Wilmington. Wilmington has experience in hosting signature sporting events of all kinds. We invite you to check it out and see for yourself.